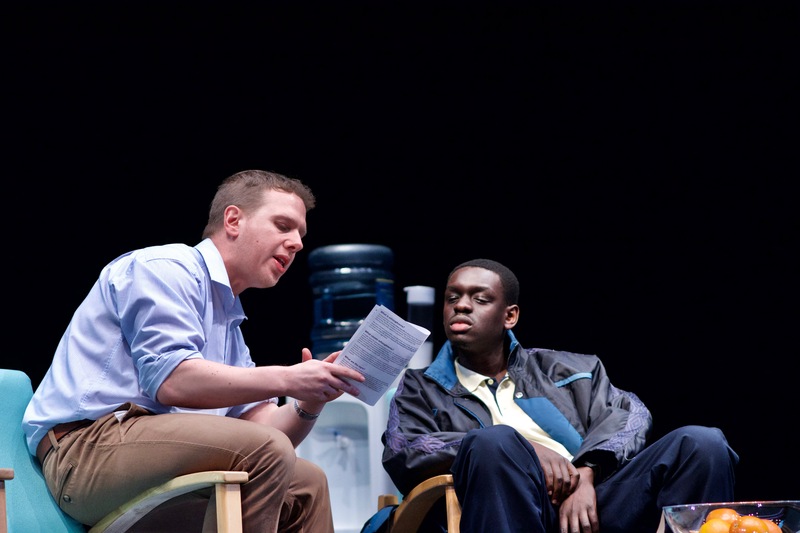 Blue/Orange is a play which centres around the themes of mental health and race. It premiered at the National Theatre nearly two decades ago, in 2000. I wondered if it would still feel relevant, or out-of-date, today. Here’s my review of Blue Orange at Birmingham REP. The play casts just 3 characters. The setting is a psychiatric hospital in London. Senior consultant Robert is played by Richard Lintern (you may have seen him investigating forensic cases in Silent Witness). Bruce, played by Thomas Coombes, is the hospital’s junior specialist. The third character is their patient, Christopher, played by Ivan Oyik. Christopher has been sectioned and admitted to the psychiatric hospital. As his doctor and senior consultant debate the cause of his psychosis, he makes the startling revelation that he’s the son of Ugandan dictator, Idi Amin. At the centre of their debate, and the stage, is a bowl of oranges. Christopher thinks they’re blue. “The reason we wanted to do the piece is that not much has changed…not so much has changed in how people are being treated. The reason we haven’t tried to set the play in modern times is because it’s more shocking it was written 20 years ago and not much has been done since”. It reflects increasing concern that there are disproportionate levels of mental illness among society’s most vulnerable groups, including young black men. Oyik’s portrayal references the institutional tendency to dehumanise people. “As a black male, sometimes we’re not seen as humans, we’re just a statistic”, he explains. He is brilliant in the role, moving the audience between laughter and despair. It’s disorientating, much as you imagine being sectioned in a hospital would be. The play also forefronts power play in the workplace – between the two consultants. Coombes plays Bruce as a liberal, patient-centred consultant; Lintern plays sernior consultant Robert who is determined to get his own way, no matter what. But, he doesn’t play him as an obvious baddie. This is a play where there is no black and white. Only blue and orange. Want to catch Blue/Orange at Birmingham REP? It runs from 1 – 16th February 2019. Book your tickets here.